More than half of the patients attending emergency centers need analgesics. Injectable analgesics are currently the most common pain control strategy, but entail complications. Fentanyl is one of the most commonly used pain-relief opiates available in various forms. The present study aims to compare analgesic effects of nebulized against intravenous fentanyl for controlling pain due to limb fracture. The present double-blind clinical trial recruited 213 patients presenting with fractured limbs to emergency departments. The first group of patients received 1 micg/kg of intravenous fentanyl citrate from a solution of 50 micg/ml and 5 ml of normal saline in nebulized form (group A), and the second group intravenously received 5 ml of normal saline and 4 micg/kg of 50 micg/ml solution of fentanyl citrate in nebulized form, whose volume reached 5 ml with the addition of normal saline (group B). Then, pain level was frequently measured and compared in the two groups for 20 minutes. The results obtained showed reduced pain level in both the groups. However, point-by-point comparison of pain in the two groups revealed significantly greater pain reduction in intravenous fentanyl group (P<0.001). The need for adjuvant pain relief medication was 8.3% in intravenous fentanyl group and 24% in nebulized fentanyl group, with a significant difference between the two groups (P=0.002). According to the results, although nebulized fentanyl is effective in controlling pain due to limb fracture, it was less effective than intravenous type, and unable to control pain in many cases. Keywords: Fentanyl, Intravenous, Nebulized, Limb Fracture. © 2017 Verki et al. Fentanyl Citrate is a mu-receptor stimulant synthetic opioid introduced about 50 years ago, and has been widely used as an analgesic for chronic and acute pain since 1990 [1Kornick C. Proceedings of the symposium" Updates of the clinical pharmacology of Opioids with special attention to long-acting drugs”-Preface. 2005.]. The bioavailability and time to peak plasma concentration of fentanyl depend on dose and administration route. Analgesia may take effect one to two minutes after intravenous administration of fentanyl, while it may take 10 to 15 minutes in buccal and tranmucosal routes. In contrast, sublingual administration and nasal spray of the new high lipophilic and low potential irritability formula made for mucosal use causes analgesia in 5 to 10 minutes [2Stanley TH. The fentanyl story. J Pain 2014; 15(12): 1215-26. [http://dx.doi.org/10.1016/j.jpain.2014.08.010] [PMID: 25441689] , 3Dale O, Hjortkjær R, Kharasch ED. Nasal administration of opioids for pain management in adults. 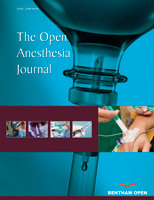 Acta anesthesiol Scand 2002; 46: 759-70. [http://dx.doi.org/10.1034/j.1399-6576.2002.460702.x] ]. Nebulized fentanyl reaches therapeutic levels as fast as intravenous fentanyl [4Bartfield JM, Flint RD, McErlean M, Broderick J. Nebulized fentanyl for relief of abdominal pain. Acad Emerg Med 2003; 10(3): 215-8. [http://dx.doi.org/10.1111/j.1553-2712.2003.tb01993.x] [PMID: 12615585] , 5Mather LE, Woodhouse A, Ward ME, Farr SJ, Rubsamen RA, Eltherington LG. Pulmonary administration of aerosolised fentanyl: Pharmacokinetic analysis of systemic delivery. Br J Clin Pharmacol 1998; 46(1): 37-43. [http://dx.doi.org/10.1046/j.1365-2125.1998.00035.x] [PMID: 9690947] ]. Intravenous fentanyl is administered at a dose of 1 micg/kg. In fact, the intravenous fentanyl dosage of 1 micg/kg corresponds to 5 micg/kg of nebulized fentanyl due to bioavailability of 20%. Hence, nebulized type is administered at a dose of 5micg/kg [6Miner JR, Kletti C, Herold M, Hubbard D, Biros MH. Randomized clinical trial of nebulized fentanyl citrate versus I.V. fentanyl citrate in children presenting to the emergency department with acute pain. Acad Emerg Med 2007; 14(10): 895-8. [http://dx.doi.org/10.1111/j.1553-2712.2007.tb02323.x] [PMID: 17898251] -9Alexander-Williams JM, Rowbotham DJ. Novel routes of opioid administration. Br J Anaesth 1998; 81(1): 3-7. [http://dx.doi.org/10.1093/bja/81.1.3] [PMID: 9771266] ]. Like other injectable medications, intravenous fentanyl entails some side effects like as other opioids, and if the efficacy of other delivery routes can be confirmed for pain relief, they can be used instead of injectable fentanyl. As a non-invasive, fast and effective pain relief method, nebulized fentanyl has been studied as a replacement for injection method. In this method, medication is absorbed through lungs and enters pulmonary blood circulation. Many studies have compared analgesic effects of nebulized fentanyl with intravenous morphine, and have shown that nebulized fentanyl acts as effectively as IV opioids in reducing acute pain [9Alexander-Williams JM, Rowbotham DJ. Novel routes of opioid administration. Br J Anaesth 1998; 81(1): 3-7. [http://dx.doi.org/10.1093/bja/81.1.3] [PMID: 9771266] -12De Berardinis B, Magrini L, Calcinaro S, et al. Emergency Department Pain Management and Its Impact On Patients’ Short Term Outcome. 2013; 5: 1-7.]. Yet, the analgesic effects of nebulized fentanyl compared to IV fentanyl are not known for pain relief. Thus, the present study was conducted with the aim to compare analgesic effects of nebulized and IV fentanyl in controlling pain of limb fracture. The present double-blind clinical trial was conducted on 15 to 55 year-old patients presenting with limb fracture to the emergency department of Imam Khomeini Hospital in Ahvaz, Iran. Pain was measured through visual analogue scale (VAS) and patients with pain levels higher than 5 were included, and fentanyl was used to control their pain. Patients using some medication such as antipsychotic, sleeping, and sedative agents, tricyclic antidepressants, selective serotonin reuptake inhibitors, monoamine-oxidase inhibitors, opioid addicts, patients with underlying diseases, such as acute or chronic liver, kidney, or heart diseases, respiratory problems including infection of upper or lower respiratory system, chronic obstructive pulmonary disease, asthma, allergy, pregnancy, breastfeeding, and these contraindicated for fentanyl were excluded. In case of any significant difference between groups regarding gender, age, initial pain score and type of fractures, they were matched. The present study was registered at Iran's clinical trials registry system (IRCT2015082423748N1), and was approved by the ethics committee of Jundishapur University of Medical Sciences in Ahvaz (IR.AJUMS.REC.1394.136). All patients entered the present study after signing written informed consent forms. Sealed envelopes containing type of therapy were placed in the emergency room and were randomly assigned to the participants. Control group patients received 1 micg/kg of intravenous fentanyl from 50 micg/ml solution (Caspian, Tamin, Iran) and 5 ml of normal saline (Mashhad Samen, Iran) in nebulized form. Case group patients received 5 ml of normal saline intravenously and 4 micg/kg from 50 micg/ml solution of fentanyl in IV form, whose volume reached 5 ml with normal saline in nebulized form. In both groups, nebulized medication was administered with 6 lit/minute oxygen over 2 to 3 minutes, which is the time taken for administration of 5 ml of medication by nebulizer, and this was followed by slow intravenous administration over 2 minutes. Patients' pain level was assessed at 0, 10, 15 and 20 minutes. If the pain level did not reduce by at least 3 points in 15 minutes using VAS, a second higher dose was administered according to the protocol containing 1 micg/kg IV fentanyl. Patients were able to withdraw from the present study at any time, but received treatment according to the routine protocol. Nebulized medication was prepared for patients using Beuerer nebulizer IH21, Germany. Air is blown through the medication at a pressure of 1/2 bars. The air flow forces medication particles out and mixes them with the air inside the nozzle. This product has a European standard of CE. Data obtained were first assessed in terms of descriptive indices, and then normally distributed quantitative data from two groups were compared using t and Mann-Whitney tests. All analyses were performed in SPSS-19 at a significance level of 0.05. Of the 213 participating patients, 166 (77.9%) were men and 47 (22.1%) were women, with mean age 49.31±5.5 years. There were no withdrawals from the present study. Demographic details of all patients are presented in Table (1). These results show the two groups matched in terms of mean age, gender and limb fractures. Table (1). The results obtained showed no significant difference in response to treatment between patients with upper and limb fractures. The results also showed no significant difference between the two groups in mean pain level before intervention (P=0.764). However, point-by-point comparison of pain level in the two groups revealed significantly greater pain reduction in intravenous fentanyl group (P<0.001) Fig. (1 ). The need for adjuvant pain relief medication was 8.3% in intravenous fentanyl group and 24% in nebulized fentanyl group Fig. (2 ), with a significant difference between the two groups (P=0.002) (Tables 1-2). pain level in the two groups. Comparison of drug efficacy in Groups A and B.
need for adjuvant pain relief medication. Seeking pain relief is the most common reason for patients attending emergency departments [12De Berardinis B, Magrini L, Calcinaro S, et al. Emergency Department Pain Management and Its Impact On Patients’ Short Term Outcome. 2013; 5: 1-7. ], such that the chief complaint of 60% of patients attending emergency department was pain, caused by trauma in 31% of cases [13Cordell WH, Keene KK, Giles BK, Jones JB, Jones JH, Brizendine EJ. The high prevalence of pain in emergency medical care. Am J Emerg Med 2002; 20(3): 165-9. [http://dx.doi.org/10.1053/ajem.2002.32643] [PMID: 11992334] ]. Trauma-induced injuries are one of the most important problems in developing countries. The incidence of such injuries has dramatically increased in Iran in the recent years, and their mortality rate is the second leading cause of death [14Khaji A, Ghodsi SM, Eftekhar B, Karbakhsh M. Trauma research in Iran: A report of the Sina Trauma Data Bank. Arch Iran Med 2010; 13(1): 17-20. [PMID: 20039764] ]. According to the reports, 30% to 40% of patients attending emergency departments require analgesics in the first 30 minutes [15Davaraani SS, Doroudgar A, Nejati A, Sharifipour E. Efficacy of acute pain control protocol in triage department on analgesics administration time and patients’ satisfaction. Advances in Biosciences & Clinical Medicine 2014; 2(2): 71.]. Although pain can easily be managed, however, it is sometimes difficult to control for the busy departments. Thus, many researchers are now seeking fast, effective, and safe analgesics. The use of intravenous analgesics is currently the most common pain-relief strategy in Iran [16Farhat A, Kouzegaran S, Sabertanha A, Mohammadzadeh A, Madani Sani F. Assessment of pain management in pediatric emergency department in Mashhad-Iran. Int J Pediatr 2013; 1(2): 25-9.]. Meanwhile, in addition to the stress imposed on patients, intravenous infusion of medications is time consuming and sometimes fails due to the absence of IV access. Studies report failure of 12% to 26% of IV infusions in adults, which is probably higher in children [17Sabri A, Szalas J, Holmes KS, Labib L, Mussivand T. Failed attempts and improvement strategies in peripheral intravenous catheterization. Biomed Mater Eng 2013; 23(1-2): 93-108. [PMID: 23442240] ]. Fentanyl is a synthetic opioid that is administered in different ways, including intravenous infusion, buccal tranmucosal, intranasal and nebulized [2Stanley TH. The fentanyl story. J Pain 2014; 15(12): 1215-26. [http://dx.doi.org/10.1016/j.jpain.2014.08.010] [PMID: 25441689] ]. Intravenous infusion is the most common administration route. However, because of the associated problems, efficacy of nebulized fentanyl has now been assessed, with promising results. In the present study, the efficacy of nebulized and IV fentanyl in reducing pain due to limb fracture was assessed. 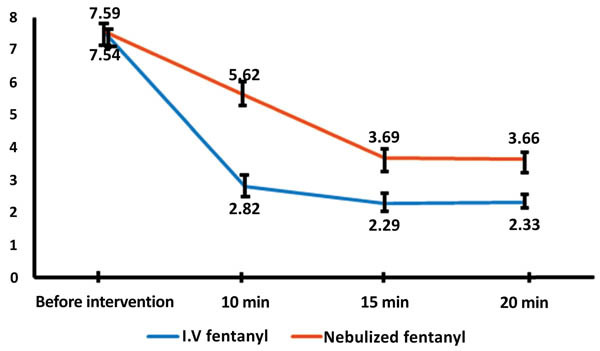 The present study results showed that in the course of assessment (0 to 60 minutes after intervention) both methods successfully reduced pain, but pain relief was significantly greater in IV fentanyl group as compared to nebulized fentanyl. The present study results agree with those obtained in a study by Miner et al., who assessed the efficacy of IV and nebulized fentanyl in 41 patients with acute pain, and showed higher levels of pain relief in patients receiving IV as compared to nebulized fentanyl [6Miner JR, Kletti C, Herold M, Hubbard D, Biros MH. Randomized clinical trial of nebulized fentanyl citrate versus I.V. fentanyl citrate in children presenting to the emergency department with acute pain. Acad Emerg Med 2007; 14(10): 895-8. [http://dx.doi.org/10.1111/j.1553-2712.2007.tb02323.x] [PMID: 17898251] ]. Some studies have shown conflicting results. Kamal et al. showed that 2 micg/kg of nebulized fentanyl had the same efficacy as 2 micg/kg of IV fentanyl in reducing abdominal pain [18Kamal S, Salah A, Hamada M, Moustafa S. Nebulized versus intravenous fentanyl for relieving post-operative abdominal pain in pediatric patients. AAMJ 2014; 12(4)]. In a clinical trial by Joel et al., 50 patients with abdominal pain were treated with IV and nebulized fentanyl in two groups, and no significant difference was observed between them in terms of pain relief level [4Bartfield JM, Flint RD, McErlean M, Broderick J. Nebulized fentanyl for relief of abdominal pain. Acad Emerg Med 2003; 10(3): 215-8. [http://dx.doi.org/10.1111/j.1553-2712.2003.tb01993.x] [PMID: 12615585] ]. Singh et al. also compared different doses of nebulized fentanyl with 2 micg/kg of IV fentanyl in 90 patients with postoperative pain and showed that 4 micg/kg of nebulized fentanyl is as effective as 2 micg/kg of IV fentanyl [19Singh AP, Jena SS, Meena RK, Tewari M, Rastogi V. Nebulised fentanyl for post-operative pain relief, a prospective double-blind controlled randomised clinical trial. Indian J Anaesth 2013; 57(6): 583-6. [http://dx.doi.org/10.4103/0019-5049.123331] [PMID: 24403618] ]. 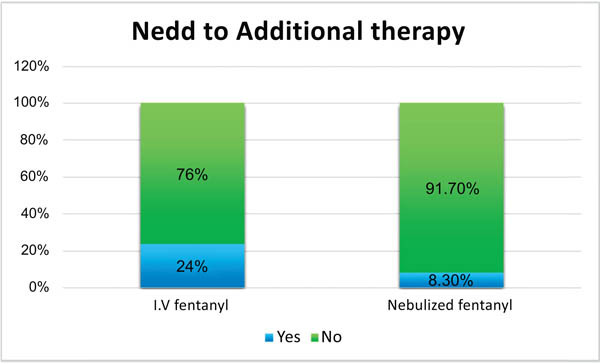 The present study results also showed that pain control failure was significantly higher in patients receiving nebulized fentanyl as compared to those receiving IV fentanyl (24% V 3.8% respectively). Similar results were obtained in Miner et al. study that showed that 3 out of 5 failures occurred in nebulized fentanyl group [6Miner JR, Kletti C, Herold M, Hubbard D, Biros MH. Randomized clinical trial of nebulized fentanyl citrate versus I.V. fentanyl citrate in children presenting to the emergency department with acute pain. Acad Emerg Med 2007; 14(10): 895-8. [http://dx.doi.org/10.1111/j.1553-2712.2007.tb02323.x] [PMID: 17898251] ]. Generally, the present study results show that although nebulized fentanyl is beneficial in controlling pain in patients with limb fracture, it has poorer efficacy as compared to IV fentanyl, and is unable to control pain in many cases. Comparison of nebulized and IV fentanyl in patients with limb fracture pain for the first time and large sample size were strong points in the present study, and not assessing different doses and side-effects of medication in the two groups were limitations of this study. The present study was registered at Iran's clinical trials registry system (IRCT2015082423748N1), and was approved by the ethics committee of Jundishapur University of Medical Sciences in Ahvaz (IR.AJUMS.REC.1394.136). All patients entered the present study after signing written informed consent forms. This article was an extract from a postgraduate thesis by Dr. Bahrami, conducted in and funded by Ahvaz Jundishapur University of Medical Sciences. Kornick C. Proceedings of the symposium" Updates of the clinical pharmacology of Opioids with special attention to long-acting drugs”-Preface. 2005. Stanley TH. The fentanyl story. J Pain 2014; 15(12): 1215-26. Dale O, Hjortkjær R, Kharasch ED. Nasal administration of opioids for pain management in adults. Acta anesthesiol Scand 2002; 46: 759-70. Bartfield JM, Flint RD, McErlean M, Broderick J. Nebulized fentanyl for relief of abdominal pain. Acad Emerg Med 2003; 10(3): 215-8. Mather LE, Woodhouse A, Ward ME, Farr SJ, Rubsamen RA, Eltherington LG. Pulmonary administration of aerosolised fentanyl: Pharmacokinetic analysis of systemic delivery. Br J Clin Pharmacol 1998; 46(1): 37-43. Miner JR, Kletti C, Herold M, Hubbard D, Biros MH. Randomized clinical trial of nebulized fentanyl citrate versus I.V. fentanyl citrate in children presenting to the emergency department with acute pain. Acad Emerg Med 2007; 14(10): 895-8. Paut O, Lang P, Massias L, Simon N. Camboulives. Pharmacokinetics of aerosolized fentanyl in healthy volunteers. Anesthesiology 2003; 99: 490. [Abstract]. Honore P, Rogers SD, Schwei MJ, et al. Murine models of inflammatory, neuropathic and cancer pain each generates a unique set of neurochemical changes in the spinal cord and sensory neurons. Neuroscience 2000; 98(3): 585-98. Alexander-Williams JM, Rowbotham DJ. Novel routes of opioid administration. Br J Anaesth 1998; 81(1): 3-7. Thompson JP, Thompson DF. Nebulized fentanyl in acute pain: A systematic review. Ann Pharmacother 2016; 50(10): 882-91. Farahmand S, Shiralizadeh S, Talebian MT, et al. Nebulized fentanyl vs intravenous morphine for ED patients with acute limb pain: a randomized clinical trial. Am J Emerg Med 2014; 32(9): 1011-5. De Berardinis B, Magrini L, Calcinaro S, et al. Emergency Department Pain Management and Its Impact On Patients’ Short Term Outcome. 2013; 5: 1-7. Cordell WH, Keene KK, Giles BK, Jones JB, Jones JH, Brizendine EJ. The high prevalence of pain in emergency medical care. Am J Emerg Med 2002; 20(3): 165-9. Khaji A, Ghodsi SM, Eftekhar B, Karbakhsh M. Trauma research in Iran: A report of the Sina Trauma Data Bank. Arch Iran Med 2010; 13(1): 17-20. Davaraani SS, Doroudgar A, Nejati A, Sharifipour E. Efficacy of acute pain control protocol in triage department on analgesics administration time and patients’ satisfaction. Advances in Biosciences & Clinical Medicine 2014; 2(2): 71. Farhat A, Kouzegaran S, Sabertanha A, Mohammadzadeh A, Madani Sani F. Assessment of pain management in pediatric emergency department in Mashhad-Iran. Int J Pediatr 2013; 1(2): 25-9. Sabri A, Szalas J, Holmes KS, Labib L, Mussivand T. Failed attempts and improvement strategies in peripheral intravenous catheterization. Biomed Mater Eng 2013; 23(1-2): 93-108. Singh AP, Jena SS, Meena RK, Tewari M, Rastogi V. Nebulised fentanyl for post-operative pain relief, a prospective double-blind controlled randomised clinical trial. Indian J Anaesth 2013; 57(6): 583-6.